A 1955 Porsche 550 Spyder sold for €2,744,000 and a 1962 Ferrari 400 Superamerica sold for €2,950,000 as the top results at the 2016 RM Sotheby’s Paris sale. A 1957 BMW 507 Roadster Series II achieved a strong €2,016,000. Four further cars sold for over a million dollars: a 2004 Ferrari Enzo, a Ferrari F50, a 1955 Mercedes Benz 300 SL Gullwing and a 1989 Ferrari F40. Highest bids of over a million dollar were initially rejected for the 1962 Ferrari 400 Superamerica and the 1997 Ferrari F50 but the deals were closed the same day and the sale prices released by RM Sotheby’s. Auction held in euro. Prices include 12% auction premium. Currency conversion at € = $1.1. The highest price paid for a car at the RM Sotheby’s Paris 2016 auction was €2,950,000 ($3,245,000) for a 1962 Ferrari 400 Superamerica LWB Coupé Aerodinamico by Pininfarina. The highest bid at the auction of €2,875,000 was originally rejected but the car was sold shortly after the auction – quiet a good deal for the buyer as the premium on the highest bid would have been a quarter of a million euro more than the announced selling price. This 1962 Ferrari 400 Superamerica LWB Coupé Aerodinamicco was the original launch car and shown at the Earls Court motor show in London and the Chicago Motor Show. It was the first of only 18 Ferrari 400 Superamerica second-series long-wheelbase examples built. It spent some time on display in the Matsuda Ferrari Museum of Art in the late 1990s. The Superamerica was restored in 2008 to its original livery of Grigio Argento over Nero. For the second consecutive RM Sotheby’s classic car auction a German car rather than a Ferrari achieved the highest result during the auction. 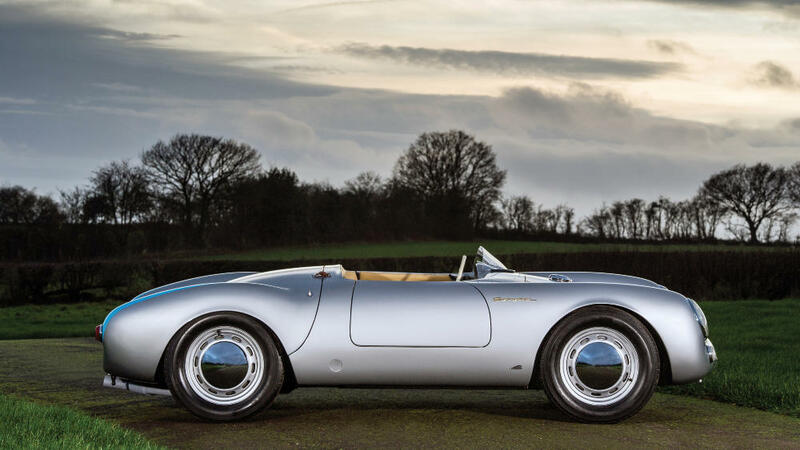 RM Sotheby’s achieved €2,744,000 ($3,018,400) for a 1955 Porsche 550 Spyder by Wendler. The Porsche was one of only 75 Porsche 550s produced for privateer racers who could drive the car both on the racing track and public roads. This Porsche 550 Spyder was shown at the 1955 Frankfurt automobile show before being exported to the USA, where it raced to victory in its debut race at Waterbro. In addition to class and overall victories in regional races in North America, this Porsche also finished 14th overall and third in class at the 1956 Sebring 12 Hours. A 1957 BMW 507 Roadster Series II sold for €2,016,000 ($2,217,600) at the RM Sotheby’s Paris 2016 sale. Of the five BMW 507s sold at auction in the past three years, only the car sold by RM Auctions at Amelia Island 2014 for $2.4 million achieved a higher result. Only 252 of these BMW 507 Roadster Series II cars were produced. This 1957 BMW 507 Roadster’s value was certainly help by its very original but well-maintained condition. The car spent almost its whole life in Switzerland with only four previous owners, including four decades with a BMW workshop owner. The highest result for an Italian car achieved during the auction at the RM Sotheby’s 2016 Paris sale was €1,568,000 ($1,724,800) for a 2004 Ferrari Enzo. Although this car has covered only 2,500 km, a crash and color change, although done by Ferrari Technical Assistant Service, certainly did not help its valuation. The result was fair given prices paid for similar cars at recent auctions but was a million dollar less than Gooding obtained for an excellent example only a week earlier at Scottsdale 2016. Bidding for the 1997 Ferrari F50 stopped at €1.2 million just €50,000 short of the lower estimate but the sale was later announced at €1,275,000 ($1,402,500). Although this was a million dollar less than Gooding obtained for an excellent F50 at the 2016 Scottsdale auction, the result is in line with prices paid for other F50s at recent auctions. Mercedes-Benz 300 SLs struggled somewhat at Scottsdale 2016 but it was back on track for this auction favorite when a 1955 Mercedes Benz 300 SL Gullwing sold for €1,176,000 ($1,293,600) at the RM Sotheby’s Paris 2016 auction. This Gullwing is not only eligible for the Mille Miglia Storica but has actually participated in the 1993 and 1999 races. It is a matching numbers car with a well-documented history of enthusiastic owners. Despite its royal connection, the 1989 Ferrari F40 sold just within the lower estimate at €1,036,000 ($1,139,600) at the RM Sotheby’s Paris 2016 classic car auction. This was one of the lower results for an F40 at recent auctions. Bonhams is expecting around similar money for the 1990 Ferrari F40 it is offering at Paris 2016. This Ferrari F40 originally belonged to Stefan Casiraghi, husband of Princess Caroline of Monaco. He sold it at her request within a few months. See also 2016 RM Sotheby’s Paris Auction (Preview) for more on these cars. RM Sotheby’s next major auction will be Amelia Island in March and in Europe Monaco in May – see Monaco Press Release for more on a 1951 Ferrari 340 America Barchetta that will be on offer.